Jesse Li is a designer who is rapidly rising on my radar; this mirrors the general rise of Taiwanese games in the past few years as well. To date, I have played three of his games (Guns & Steel, Ponzi Scheme, and The Flow of History) – and I have been quite impressed with the completeness of the games. Each of his games seems to take a well known mechanism and gives it a major twist to give the whole thing a fresh feel. In Flow of History, Mr. Li gives us a short civilization building game with an interesting economic system. 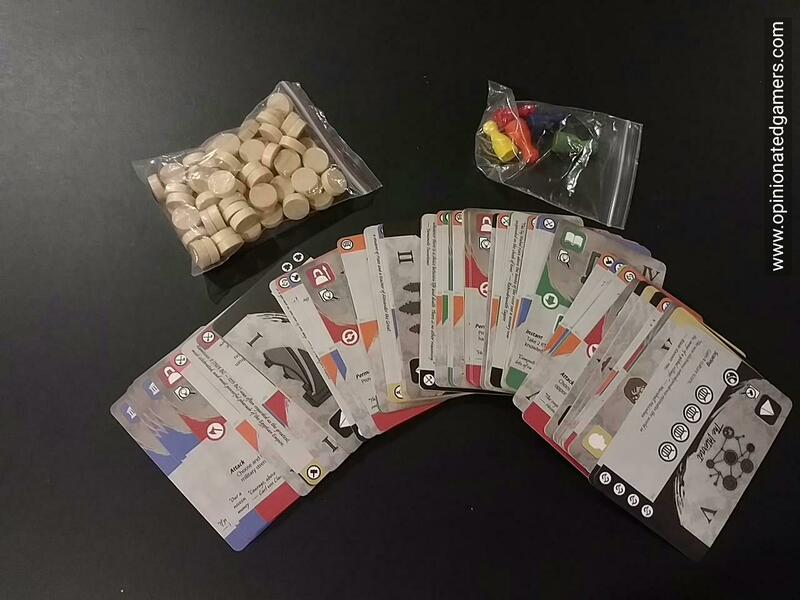 The components to the game are quite simple – a deck of 67 cards and some wooden bits. There are six types of cards in the deck. 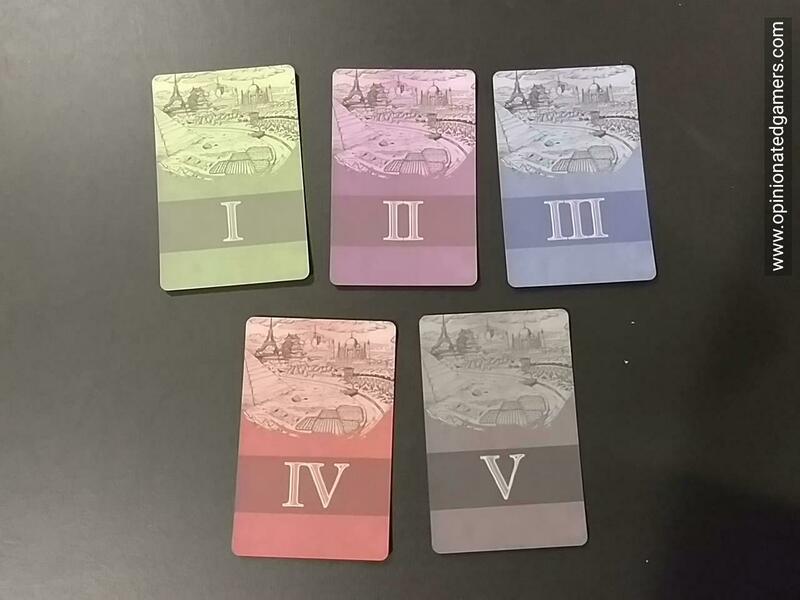 Based on card backs, they are can be separated into 5 Ages as well as a few special cards to start the game and to end the game. 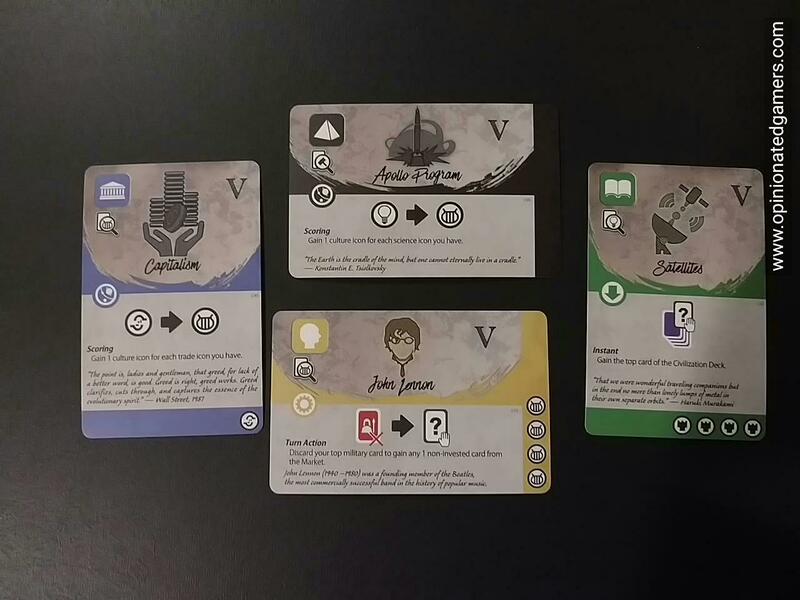 Each player gets a starting civilization card to represent his starting government. Each player also gets a player marker in his color and four resource markers. The deck is arranged with the earliest era cards (I) on top and the latest (V) on the bottom. Then a market of 5 cards is flipped up in a row on the table. Choose a card which is not yet invested in by any other player. 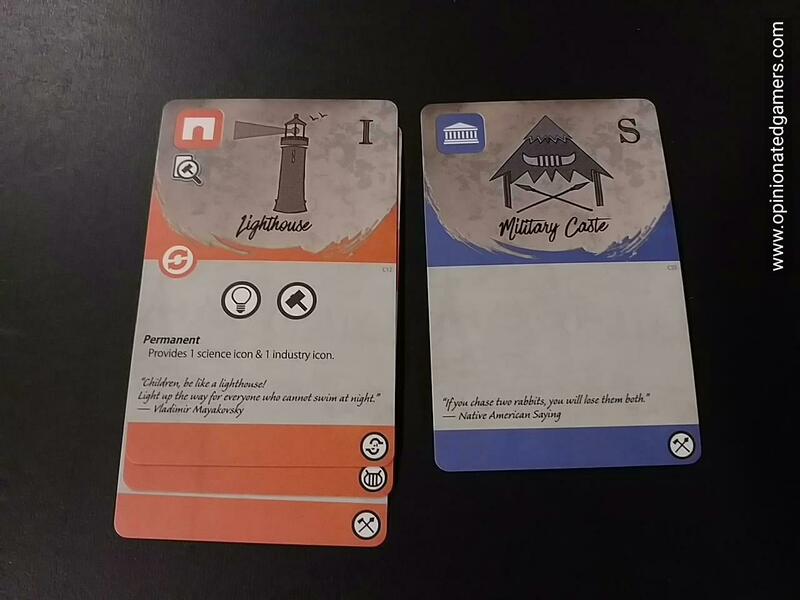 Place your player marker on the card as well as one or more resource tokens. You may not take this action if you are invested on another card OR if you have no resource tokens to place on the card. If you have a card on the table that you are invested in – you can choose to complete it. Discard all resource tokens on it to the supply and apply the Investor bonus if applicable (count up all matching production icons on your previously acquired cards and take that many resource tokens). Take the card and add it to your nation. The method of doing this depends on the type of card. If it is a Leader card, you discard your old one and replace it with the newly acquired card. If it is any other card (Government, Knowledge, Military or Construction), it is placed on top of the stack of all similar type cards so that you can see all the resource icons in the bottom stripe of all cards but also so that you can only see the effect area of the topmost card. You will always have access to the resource icons of all cards, but you can only use the effect of the card on top. Once the card is in place – look at the effect printed on it; if it is appropriate, you activate that effect at this time. If an opponent has invested in a card that you want, you can snipe it by paying a matching amount of resource tokens bid on the card to the investor. The resource tokens on the card are moved to the supply. The investor now gets resource tokens from the supply equal to the number of trade icons in his nation. Then, he also gets half (rounded down) of the resource tokens remaining in the supply. The sniping player now takes the card and adds it to his nation. Rules for placement are the same as when you complete a card. Note that you do NOT get the investor bonus here. Then, apply the card’s effect if applicable. If you have a card in your area with a “Turn Action” effect, you can choose to enact that effect. The result of this action might be to acquire another card. If this happens, after you place the new card appropriately, you then enact the new effect on this card if appropriate. Count the number of Harvest icons in your nation, then add that many tokens from the reserve (i.e. the box) to the Supply. Then take half (rounded down) of the supply into your area. Finally, if you have fewer resources than the current Age, you can take resources until you match the number of the Age. 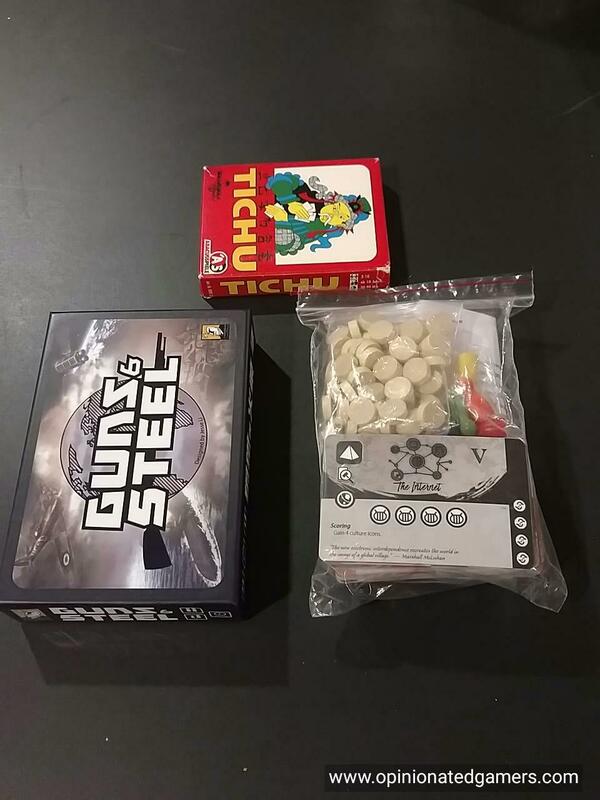 There is a lot going on in this game of only 67 cards – like Guns and Steel, a previous game from the same designer, the complexity and genius of the game come from the interactions of the different cards in the game. In most games, you will get through nearly the entire deck – so the composition of the cards in a game won’t change; the trick here is figuring out which cards you need/want to work together and then getting them into your nation. The main variability in the cards will be which cards in the final Age will be left in the Market – as the game ends when the final card in placed in the Market, that means that there will usually be four other cards which were not put into play; otherwise, most other cards will make it to the table. In our games, we have been discarding only around four or five cards per game due to the age limit. The system of acquiring cards is pretty unique – the bidding system slowly ramps up over the course of the game as more and more Resource tokens enter the game. At the beginning, each player only has four RT, and I believe that we had 30+ on the table at the end of our most recent game. Thus, a bid of three is pretty strong in the first few rounds, but seeing them hit double digits was not unheard of in the end game. There is always the option to snipe at the cards that your opponents have bid upon, but you will end up spending more because you do not get the investor bonus (which returns RTs to you) AND you have enriched your opponent substantially. This can be turned around as well – you could choose to lie low with your bids and hope to be sniped. If you have gathered up enough trade icons, it can be quite lucrative which will then allow you to bid/snipe on other cards. We have also seen an interesting strategy where Karen didn’t like the cards on offer at the Market and she managed to accumulate a huge portion of the RTs; she then used this mass to cherry pick a few of the later cards that came up. There are also lots of interesting decisions to be made with the cards because of the fact that you can only use the top effect of five of the six types of cards (everything but the Wonders). Early in the game, you have to choose your cards carefully to make sure that your engine grows in the way that you want. In the mid to late game, you now have to start making decisions about adding cards with Scoring effects to your stacks – but as these go on top of the stacks, you will lose the in-game abilities/effects that got you to that point. Remember, that you will always keep the icons on the bottom, and you need to balance the two “engines” with each other: icons on the cards as well as active abilities in your tableau. Managing your faceup cards can be challenging as well; surprisingly, some of the effects of the early age cards are pretty powerful (such as giving your 3 towers for defense) – and you do have to be aware of the effects of replacing particular cards. There may be times where you will end up replacing a card with a lesser effect. However, in general, you should continually try to add more cards to your nation – because you will need to have an increasing number of icons in order to continue doing things in the game, and each of those icons are worth victory points at the end, so collecting more cards should be increasing your score as well. Increased icons also gives you higher investor bonuses which will in turn keep you in the running to bid/snipe at the cards that you want. The attack/defend system is pretty easy to manage, and it helps to try to at least keep close to the group. Interestingly, some of the attacks are targeted, so any presumed leader will be hit a lot by attacks unless you have good defenses. Of course, if you’ve spent time collecting attack/defend cards, then you’re less likely to have the good VP producing cards! The game plays quickly, and I think that once we’re familiar with the setup and cards, games should come in around 45-60 minutes for a 4p game. In our first two goes, we’ve been around 85 mins, but that includes a round of rules teaching and then a few consults to the rulebooks for questions. Additionally, it has taken a bit more time to read the cards and familiarize ourselves with them – this is mostly looking at the cards in the Market. Due to the stacking of cards, you usually only have no more than 7 or 8 active cards at most in your area, and some of these might be endgame Scoring effects that you don’t necessarily need to be keeping track of midgame. I have a pre-production set of cards, but I believe that the artwork on them is final. There is a bunch of information on the cards, but the layout is clean and the information is easy to see. There is even space on most cards for a quote from a historical person. We didn’t have too many issues with the card actions as they are well explained and iconified on the cards. There is a whole lot of game packed into this small box, and this is one that I think we’ll be playing a lot this winter. While I don’t have confirmation, the entire game fits in the baggie on the right. I’m assuming it’ll be in a small box like Guns&Steel seen on the Left. A Tichu box at top for scale. I’m definitely looking forward to a full production version of the game, and after my first few plays, I would highly recommend this one for an Essen pickup. 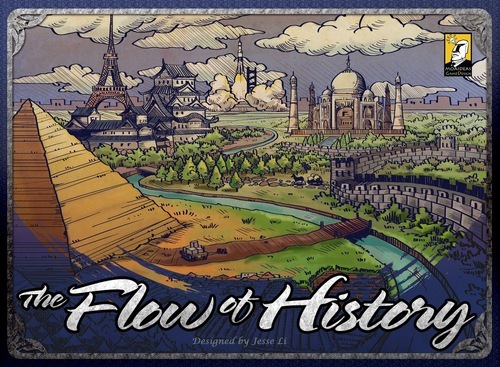 Flow of History gives you a very meaty game in a small package with a decent game time. This entry was posted in Essen 2016, Preview. Bookmark the permalink. Thanks for the kind review Dale! 1) The cards & wooden bits shown above are the final products. Still waiting on boxes…. 2) The box will be Joraku sized (twice the size of a G&S box), since the cards are thicker they won’t fit in a G&S box after sleeved. Cards are 7-wonder sized so sleeves should be easily obtained for people that likes to sleeve cards.